1. If there are less than two of any combination of toilets/urinals and all are taken, wait outside of the bathroom until someone comes out. 2. Never speak to or look at your neighbor while relieving yourself at the urinal. This is no time for small talk. 3. If there is a bathroom attendant, wash the willy off of your hands even if you don’t have a dollar to give him. I don’t want to indirectly touch your junk as I open the door to leave. 5. Check for toilet paper before sitting, not after. It could cost you a pair of underwear. 6. Don’t talk on your cell phone while in the stall. That’s just weird. 7. Lock your stall door. Not everyone looks underneath for a pair of feet. I feel really bad for whoever is in charge of emptying trash cans, but hey – rules are rules. Actual sign on restroom door on Rte 66/I-40, 60 miles east of Amarillo should be rule 9. I say that every time I walk in. Yeah, that’s pretty scary that you can only flush toilet paper…ick. Great post. 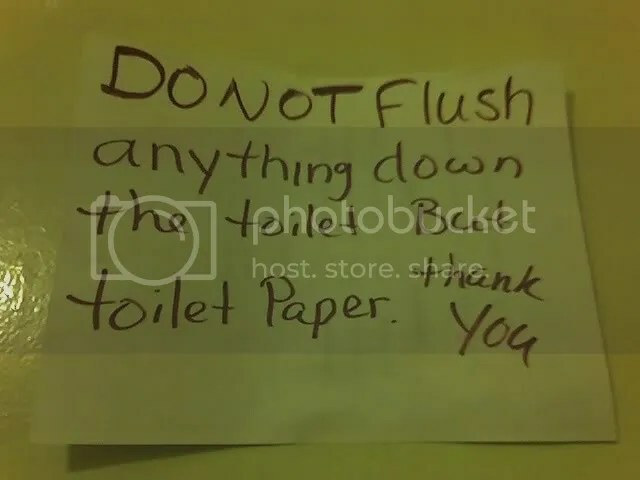 I was in Mexico once and the sign said the opposite, “Do not flush toilet paper”. The trash can next to the toilet was pretty nasty… not as nasty as yours though. They must pay their janitor a good wage. I remember that sign. It cracked me up! Next time I eat lunch with you, I’m going to go to the bathroom and then call you from there to give you an update. Better yet, take a picture and send me a text. Great post! I had a boss who insisted I take my two-way radio into the bathroom with me incase he needed something during the 90 seconds that I was away from my desk. That makes me wonder what your job was.